First, I'd like to thank the Greeks... for making one of the most difficult items to work with, ever. Tackling filo dough is not an easy feat. My advice for this recipe: get filo dough cups. That was my original plan, but Shop Rite was out of the cups, and I thought, I'll just get the sheets, how hard can it be? HARD, my friend. Once I played around with it for a while, I figured out the easiest way to accomplish this cute appetizer, and it wasn't that bad. But still nothing I'm itching to work with again soon. 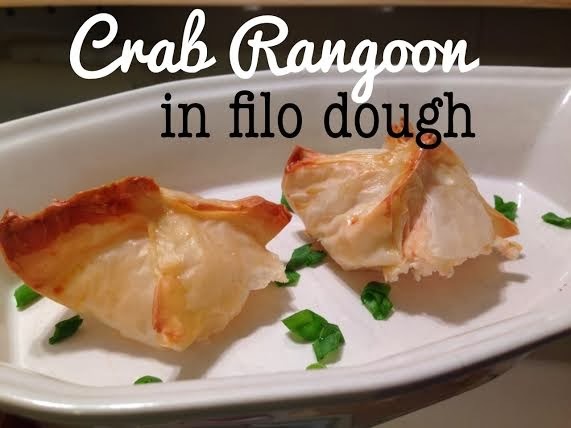 Anyway, now that I've scared you - please read on to find out how to make your own crab rangoon! Tastier, healthier, and better than what you're getting with your Chinese takeout. 1. In a food processor, mix the cream cheese, sour cream, crab meat, 1/4 cup chopped scallions, cayenne, celery salt, and garlic powder. 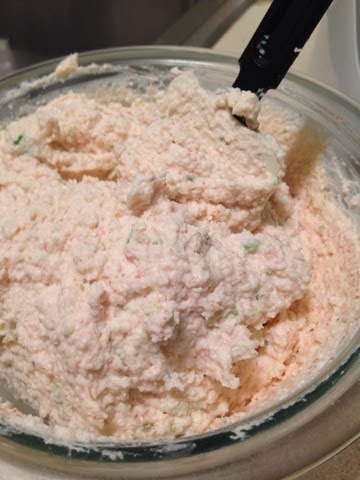 Mix until well incorporated and all cream cheese chunks are gone. 2. Unroll your filo dough and keep covered with a damp paper towel so the filo doesn't dry out. It will dry quickly. Layer about 6-8 filo sheets on top of each other and then cut the large sheets into squares. You should get about 6 squares. Repeat with as much filo as you have. 3. 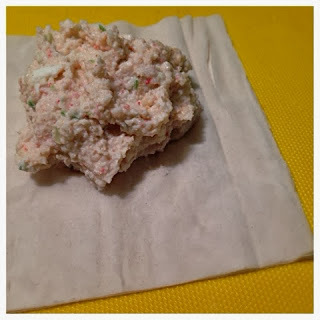 Spoon your creamy crab mixture into the middle of the layered filo squares. Brush all four sides with egg wash and bring all four corners of the square together and pinch at the top to make a cute little package. Egg wash the outside of the "package" and place on a buttered broil pan or a baking sheet with a buttered rack. Repeat as necessary. 4. Bake in a 400-degree oven for about 25-30 minutes, or until filo has browned and has a slight crunch. Place on a dish and sprinkle with remaining scallions. Enjoy!